How will Russia react to Ukraine’s battlefield successes? Yesterday, the Ukrainians launched a major assault on Horlivka, to the north of Donetsk, and the city looks like it will fall in the next day or two. Ukrainian forces have also interdicted one of the main road links between Luhansk and Donetsk, Highway M-04 (see map on link below), the road used to bring most of the heavy equipment from Russian to the Donetsk and earlier to Slavyansk. Ukrainian forces are also attacking Tonez, Snizhnye, and Shakhtar’sk and are reportedly approaching Krasny Luch. As a result, the separatists have apparently lost control of the second major route from Russia into Donetsk, Highway M-03. At this point, the Kremlin must feel pressure to intervene openly. While it is possible that the rebels will resist the Ukrainian offensive against Donetsk effectively, and the Ukrainians may well cause a lot of civilian casualties by using artillery, Grad missiles, and air strikes in the city, it is also possible that the separatist will be routed. Igor Streklov, the commander of the DPR military, has stated that he does not think his forces can hold out for more than two weeks in Donetsk. And civilian casualties have been mounting – yesterday there was particularly disturbing video of the aftermath of an MLRS Grad attack on Horlivka that reportedly killed some 20 civilians, including at least three children. Given Putin’s earlier statements about the Russian government’s duty to protect Russia’s compatriots abroad, the Kremlin must be giving serious consideration to taking whatever steps it feels are necessary to turn the tide of battle back in the separatists favor. Nevertheless, it is difficult to see how it goes forward from here. It has been shelling Ukrainian positions near the border for several weeks now; it has shot down Ukrainian aviation near the border as well; and it has been supplying the insurgents with more fighters, armored vehicles, other heavy equipment, including Stela-10 SAMs. (Happily, there are no signs of Buks having returned to the combat zone.) Ukrainian and American intelligence sources indicate that they expect Russia to supply the separatists with powerful Tornado MRLS systems in the coming days. But none of this seems likely to blunt the Ukrainian offensive, especially now that the major roads going into Donetsk have been interdicted. If the Kremlin continues its current course, we are going to reach an inflection point where significant Ukrainian forces are going to approach the border and come into range of Russian artillery and rocket strikes. So far, Russian strikes against Ukrainian positions have hit targets that can’t strike back, but that will change if the Ukrainians continue to move south, in effect daring the Russians to fire on them. If they take the dare, I suspect the Ukrainians will fire back. In short, the military phase of the conflict may be coming to a head, but it is far from clear how it will play out. 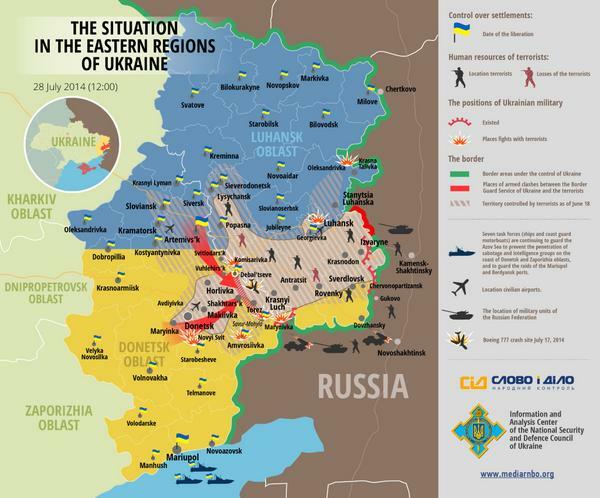 The battles for Donetsk and Luhansk may be over in a few weeks, or they may last much longer. They may cause a lot of casualties, or they may not. The Russians may ramp up the flow of arms to the insurgents, but they might also significantly increase incursions and shelling and rocket strikes from across the border. They might also establish a no-fly zone in the theater of operations or even announce a “humanitarian invasion.” And we may well witness air-to-air combat between Ukrainian and Russian fighter jets, Russian SAM strikes against Ukrainian aviation from Russian territory, Ukrainian SAM missile strikes against Russian aviation coming across the border, and artillery and rocket exchanges across the border.